I spend a lot of time with the quarian lately; she's become my favorite. Though if I'm being strictly honest, she's actually the third quarian. The first two long since reached the limits of their potential with me, and are now off fighting some other battles elsewhere in the galaxy. It's the Mass Effect 3 multiplayer mode that's gotten me hooked. I've been spending hours and half-hours here and there with it many weeknights and nearly every weekend since the game launched, and for me, that's a first. I originally came to Mass Effect because I loved the stories of the people who made up the living, breathing soul of the Milky Way. But those stories, those companions and enemies and larger-than-life heroes, are completely absent from the multiplayer experience that of late I find myself so addicted to. So what gives? It's not that I've never played an online multiplayer game before; it's that I haven't generally enjoyed one enough to keep coming back to it when I didn't have to. And in all honesty, I didn't expect to enjoy it with Mass Effect 3. I resented (and still resent) the implicit requirement that I go online and work my way through a number of 20-minute bouts mowing down mooks in order to complete Commander Shepard's single-player story to my satisfaction. When I played through ME3 with my imported Shepard, I played for character and for story. I lingered fondly over the Normandy and the Citadel, seeking out every conversation I could with the NPCs I liked best. I only sought out multiplayer adventures when there was only one mission remaining in my journal, the ultimate point of no return for the game. I worked my way through enough matches to get my Galactic Readiness up to 75%, and then bailed, running back to finish the single-player story before my number could deteriorate. I was done. Multiplayer was just an inconvenient add-on, not for me. Having finished ME3 twice, I set it aside, assuming I was finished until more DLC inevitably arrived. Six weeks after starting, I've decided that I really love playing Firebase Hydra, with Firebase Dagger as a close second. Firebase Ghost and Giant aren't bad either, but I groan aloud every time I get thrown into Firebase Reactor. I hate that freaking map. The "key enemy personnel" and "enable / disable four devices" wave types are my favorite, but I cringe whenever the team has to band together and defend a computer that inevitably gets placed in an absolutely terrible defensive position, with little to no cover. Having to stand in the open for three waves out of ten made for one particularly excruciating round. But what I really love is that I'm getting better. I play Infiltrator by preference, and after a few weeks of doing it nightly, I'm really getting quite good. I've mastered the use of Tactical Cloak to run right past Cerberus, geth, or reapers to where I am needed most. I've become excellent at finding defensible sniper positions, and at taking down my enemies with a single, well-placed shot. Invisible, I can dart about the map to reach targets while timers tick down, or move to a fallen comrade while s/he can still be revived. I don't often play games just for the sake of building a particular player skill. I enjoy games with narrative arcs, games where you gain more weapons and powers as you level up, games where over time you earn a bag of tricks that you can deploy at will. But Mass Effect 3's multiplayer has drawn me in, and has me actively working to get better at it and to take on harder challenges. BioWare's Mass Effect team said outright at PAX East that they hoped continued multiplayer content would keep discs in drives and players engaging with the game, and I have to admit that on me, at least, it's working. Our own Kate Cox is at PAX East, liveblogging BioWare&apos;s Mass Effect Panel. What helped me warm up to it was a sense of safety and comfort. After playing Shepard as an Infiltrator through three single-player games (and playing those games more than once each), I knew how to handle the character type. I knew, from my single-player experience, how Cerberus operated and how reapers were likely to attack. I felt that I had enough knowledge, going in, not to embarrass myself so badly that I couldn't continue. And so I had the confidence to learn more. 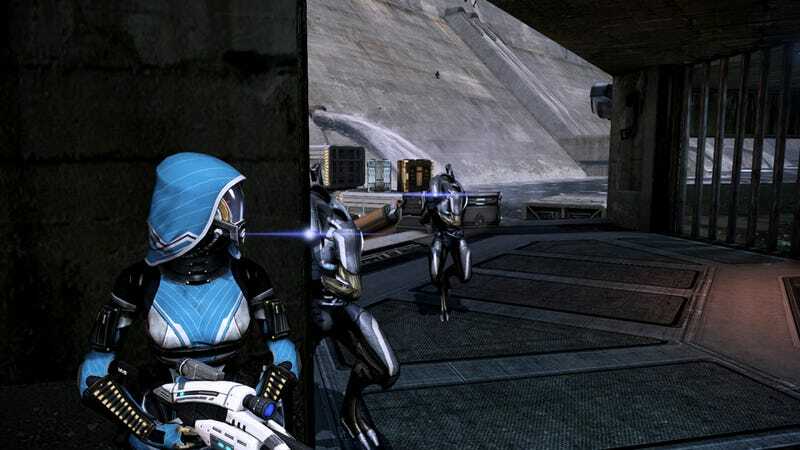 Does the multiplayer add significantly to the true core experience of the Mass Effect arc? Not really. While it's clever to get a bit of insight into the "offscreen" battles being waged elsewhere while Shepard takes the starring role, the premise wears thin quickly. The multiplayer maps show up in the single-player game as N7 missions, and there are only so many times that Admiral Hackett can command you to take down four conveniently-appearing high-ranking enemy personnel before the pretense wears off. But it's got me invested in the universe in a whole new way. It's made me willing to play pretend, to go along with the story I'm being told. It's made me want to take down reapers, to keep that Readiness at 100%, and to be sure that I'm not the weakest link in the chain. It's made me want to join in on weekend bonus missions and to earn the virtual credits that pay for new virtual guns (one of which, someday, must eventually be a better sniper rifle. Please, game?). And more importantly, it's made me willing to give a fair shake to multiplayer modes on my single-player games going forward. Kotaku boss Stephen Totilo just found tremendous value in the upcoming Max Payne 3's multiplayer mode. Single-player games I love, like Assassin's Creed and Uncharted, have been trying to entice me online for a while now. Perhaps I've finally learned to listen.